The last great AC/DC record was Back In Black. There I’ve said it, and I’ll stand by it. I was worried about the future of the band with the loss of Bon Scott and was impressed with their release of Back In Black and then, it all fell apart for me. There were the occasional singles that were decent but overall I lost interest in AC/DC. All of the While I continued to purchase each release with the hopes of finding something inspiring within. 2014 brought us the news of Malcolm having health issues and leaving the band and Phil Rudd living up to the bad boy rocker image, and the news of a new record. Could these issues give the album a new fire? I hoped. I received my copy and with fingers crossed, shut out the world, and listened. What was there was an average AC/DC record. There were no tracks that jumped out and grabbed me like the songs of old. Don’t get me wrong, the tracks are not terrible, just not great. Their playing is still excellent and powerful, but the songs themselves are not. I feel that they have found a comfort zone and are playing safely within it. They’ve still got “Big Balls” though. 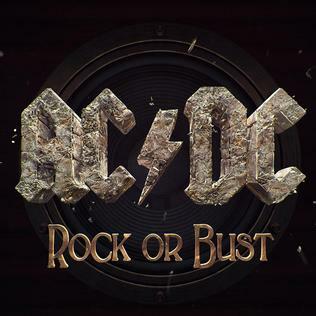 Rock Or Bust? Sorry AC/DC, it’s a bust for me…. This entry was posted in Artist, Bassists, Classic Metal, Classic Rock, Guitarists, Heavy metal, Internet Radio, Legends, Metal, Music, Rock, Rock N' Roll, RockStar, Sleaze, Vocalist, Words, Wornstar Clothing and tagged 70's, 80's, AC/DC, Angus Young, Aussie Rock, Australia, Bleach Bang, Bleach Bangs, Bleach Bangs Radio, Brian Johnson, Charlie Owens, Classic Rock, Cliff Williams, Glam, Glam Rock, Hard Rock, Heavy Metal, Metal, Music, Phil Rudd, Randy Norris, Rock, Rock N' Roll, Rock Or Bust, Rock Star, RockStar, Stevie Young, the Hellion, the Hellion Rocks. Bookmark the permalink. ← Was Dimebag really that great?